Previously singed to BEC Recordings, American singer/songwriter Ryan Stevenson recently released his debut full length solo album Fresh Start this past week, although the album was available for full streaming via The Overflow app a few weeks ago. Immediately audiences have resonated with Ryan’s relatable style vocally and lyrically as well as a freshness to his music. Now signed to Gotee Records, the home of artists like Finding Favour, Jamie Grace and Capital Kings, these 10 songs that are now available to the public are sure to impact many, just like Ryan’s previous singles such as “Holding Nothing Back”, “We Got The Light” and “Speak Life”. Produced by Bryan Fowler, with Christopher Stevens and Chuck Butler having a hand in the production process as well, Ryan’s new release, dropping alongside albums from artists such as Big Daddy Weave, Andy Mineo, Leigh Nash and Jason Crabb, is well worth the listen. Although containing a few CCM lyrical and musical clichés, and though this album isn’t my absolute favourite of the year; there’s no denying Ryan’s heart, so let’s dive in to find out how the singer who sounds a lot like TobyMac, has found a place in our hearts. The album opens with the heartfelt and musically simple title track. Although “Fresh Start” opens up pretty awkwardly, with Ryan outlining what the song and album are about in a 20 second rap/interlude (which in my opinion wasn’t needed anyway! ), the song comes into its stride moments later, with the main theme being about forgiveness, and God providing us with a lifeline, a new lease of life, if we just accept it. As Ryan earnestly mixes rhyme and poetry with ingenious songwriting, declaring that ‘…I’m ready for a fresh start, take my heart, do whatever you gotta do to get through, I’m begging for a clean slate, this day, wash me in amazing grace, wash it all away…’, we are reassured by the promise of God that we can have a fresh start in His love and grace. Authentic and inspiring, Ryan’s album opener is a gem of a melody that has me tapping my toes, and it’s pretty cool that Ryan tries his hand out at rap as well. The acoustic guitar led first single “All Yours” is next, and oozes with slick production, emotional lyrics and more transparent and relatable themes, as Ryan highlights that ‘…I am all, all Yours, the only way I’m free is to give You everything…’. Outlining that surrender to God and allowing Him to move in our lives, is the way if we are to experience true freedom and happiness, CCM clichés abound here, with repetition and catchy guitar hooks ensuring that this melody will be played countless times on Christian radio, although the song is not terrible by any means, as Ryan’s heart is in the right place, and he does his best to convey the message of gratitude and thankfulness to God for giving him a new lease on life, a theme similar to the album opener. However, while this single isn’t that lyrically and musically creative (honestly, hasn’t “All Yours” been recorded already in the form of “Take Everything” and “Surrender” by Seventh Day Slumber? ), Ryan’s previous single, “Not Forgotten” with TobyMac, also present on this album, thankfully is a welcome addition here, with Ryan and Toby singing in beautiful harmony, each of them reminding us that ‘…we are not forgotten, we are not alone, He is holding us and He’ll never let go…’. An earnest reminder led by fervent guitars, that God is with us every step of the way and that His faithfulness and promises are true and dependable forever, the song is led by mid-tempo guitars, and lyrically the song is simple, yet in this instance necessary, as the simplicity of the melody and lyrics accentuates the theme more tthan God is with us. Well done Ryan, a worthy addition to a varied and musically diverse tracklist. While one single is captivating, another less so, and the title track a tad awkward through the excessive rhyming (although still catchy and thought-provovking! ), the remainder 7 tracks fall in between the spectrum of pure genius and utter head scratching, which in the case of a debut album, isn’t that bad. “Mercy Changes Everything”, littered with hand claps and inspiring lyrics, musically feels a bit flat, with synth and acoustic guitar present throughout meaning that there is no build up or epic crescendo but rather a constant barrage of pulsating drums contributing to a slight headache during the first time I was listening to the song. Thankfully the second and third times, the song grew on me, and with the song firmly rooted in the notion that God’s grace and mercy changes our life perspective for the better, how could you not grow to love the song, if not at first? Granted, this song still has a long way to go before becoming a favourite of mine, although in this case, it is Ryan’s lyrics ‘saving’ the simple music. “Chasing Your Heart”, a pop 3 minute tune, is abound with remix-y effects, as Ryan powerfully reminds us of how ‘…I’ll never stop chasing Your heart, my dreams live wherever You are, and even when I’m falling apart, I’ll never stop chasing Your heart…’, giving us impetus to boldly and actively follow after Jesus even when the world says otherwise; while “Give It All Away” is a mysterious, ethereal piano led disco themed rap infused unique melody, as Ryan highlights how his love for Jesus, and devotion to Him, leads to him giving his life away to God, and encourages us to do the same. Our love for Jesus and His evident presence in our loves should be impetus and reason enough for us to follow Jesus with everything we have, and not feel embarrassed or ashamed about that fact. Though “Dare You To Trust My Love”, a song sounding a tad overly CCM, and sung from God’s perspective, should inspire us to go deeper into the love of God, as Ryan outlines that God will never leave us (see the trend and theme encompassing this whole album!). But after many songs of hearing almost the same concept of God being with us every day; this inclusion feels forced, despite maybe me loving the track later, or perhaps this melody having more of a solid foundation that others preceding it. Probably one of the most personal and emotional songs on the album, and one that shows off Ryan’s songwriting skills id “From The Ground Up (Bonzana)”. Though not explicitly a Christian song, Ryan permeates and invades this song with exquisite metaphors and imagery for how the town of Bonzana in Oregon, has shaped him as a person, with the themes of the melody reminding me of Finding Favour’s “Tiny Town”. Going as deep as he can ever go, with Ryan including a rap refrain about his mother’s passing and how she influenced his life more than he could ever imagine; Ryan has to be commended for this song in particular, as he has worn his heart on his sleeve, and has shown his vulnerable side. With the radio friendly electric guitar led mid-tempo ballad “What You Say” another album highlight, with Ryan skilfully using juxtaposition and passionately and unashamedly proclaiming that no matter our views on this life, God’s view is the only one that matters. As mentioned in the chorus, that ‘…I say it’s over but You say it’s beginning, and I say I’m guilty, but You say forgiven, and I may be broken, but Your words bring healing, so no matter what I’m feeling, this time I’m believing what You say…’, God’s words are final, and as Ryan has reiterated plenty of times in this album that God’s promises ring true and His faithfulness can be trusted; this song is yet another gentle reminder of the grace of God, and how we are given new life even when we don’t deserve it. Standing tall at 5 minutes, the album ends with the piano driven “The Eye Of The Storm”, a gospel flavoured story song, and inspiring piece, reminding us that we can trust God in all circumstances, especially the difficult ones, as His promises and faithfulness, once again, can be trusted. With the song featuring Gabe Real on vocals, the album ends on a joyful and optimistic note, as we are given hope that though our problems can break us, we won’t be broken forever, as our problems are only confined this world, and God heals, redeems, restores and makes whole in this world or in heaven. What a wonderful notion to believe and cling onto, well done Ryan for a compelling and encouraging album closer, and album overall. 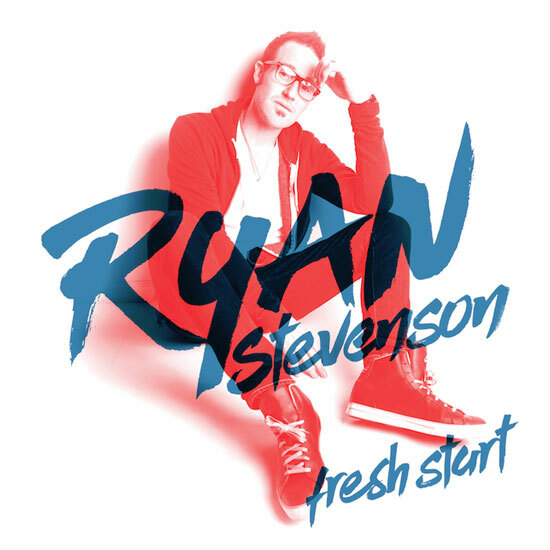 Fresh Start by Ryan Stevenson isn’t perfect, as there are a couple of tracks that are a bit misplaced, either lyrically or musically. And the theme of the album is evident in every single song- I may have wanted Ryan to explore more territory lyric wise, of God’s qualities other than the fact that He is with us. But those are nit-picks in an album that is solid for a debut record. Even though Ryan’s album isn’t as grandiose or epic as Big Daddy Weave’s Beautiful Offerings, Ryan does just enough for me to be intrigued by what may release in the future. So should you check out this EP, considering how many songs I didn’t find immediately pleasing? Yep, you still should, as we’re all different people. You may love Fresh Start or hate it, but one thing’s for sure, you’ll be hearing more of Ryan Stevenson in the near future as he builds upon the platform he’s laid the soli groundwork to here. Previous PostBig Daddy Weave – Beautiful OfferingsNext PostTop Ten Most Anticipated 2015 Fall And Midseason Shows! This album is one of the pleasantly surprising album I have listened to this year. I love everything about it. The song I love the most is What You Say. It kind of reminds me of Mandisa’s Truth About Me. My next favorite is The Eye of the Storm. Even though many may not understand the reason for my excitement when I listen to the songs on the album, I think Ryan Stevenson needs to be given a thumbs up.